Start water for the noodles. In a large pan, melt butter & oil over medium-high heat and cook the onion for 3-4 minutes until golden. When onions are done, start cooking the noodles. To the onions, add cabbage, caraway seeds, salt & pepper. Cook and stir for 6-7 minutes. Remove from heat and stir in drained noodles and 1 tablespoon butter. Reduce the cabbage to 3 cups. Reduce salt to 1/2 teaspoon. After adding cabbage & spices to the onions, saute for 2 minutes. Add one cup of drained sauerkraut and cook another 5 minutes. 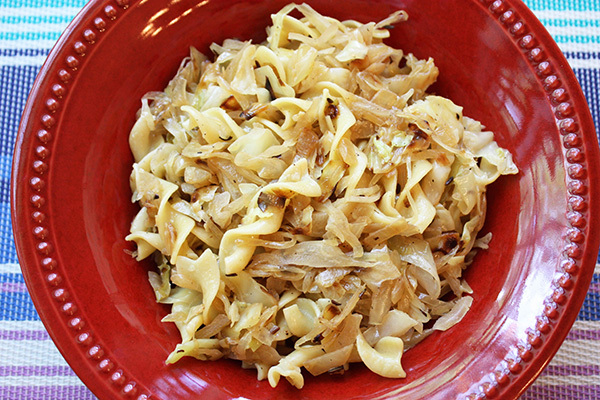 34 Comments on "Haluski Cabbage & Noodles"
Now that I’m retired, I’m happy I found your website because I have more time to search to my heart’s content! I have made both your single loaf white and whole wheat bread, and was super pleased with how they turned out. I used to watch my mother make her bread without using a recipe and had never tried it on my own. I’ve already printed out a couple of recipes tonight, and will keep searching for more. Love your videos, they are so very helpful! Made this and loved it! Thank-you Jenny….I’ve also made your fantastic cabbage rolls and wonderful white & WW breads! Thanks again….a fan from London, Ontario! Made this tonight and it was a gigantic hit with my perogis! We belong to a National Polish Catholic Church in Mosinee Wi..
Polish food like Pierogis,Sauerkraut and Polish Sausage! Never had the Cabbage and Sauerkraut! Must try! Our church serves these Polish foods! my grandparents are polish. cant beat there cooking just love all your recipes.keep up the great work jenny. Jenny do you have a babka recipe? Love your recipes!!! Oh Jenny, Came across your YouTube videos just by scrolling and I have so thoroughly enjoyed every one of them especially those on cooking ~ Polish. Parents deceased and now also a widow watching you cook online brings back so many wonderful memories- mama being Polish and daddy Ukrainian. Thank you. I have picked up ideas for changing my recipes that are similar to yours. And the hope and joy I once knew are renewed thanks to your cooking shows. It was such a surprise to find you online…I have told many people to watch you for inspiration and information on Polish cooking. Your humor is an added perk! My Slovak grandmother made a similar dish except she used dumplings rather than egg noodles. Will give the noodles a try. Loved her cooking!!! I make something similar to that. I add pierogi to the cabbage and fry it all together. Cooking with one of the famous cooks. You’ll knock them dead! Your personality is so funny…please, promise, I’ll be so devoted to you. Hi Jenny, I truly appreciate the Polish recipes you publish.. I have fond memories of eating haluski at Polish wedding dinners. I learned the recipe acouple of years ago and like to toss in some keilbasa for a one pot meal. Thanks for the vides and recipes. Thank you Jenny. I am making this tonight using your sauerkraut version. I love sauerkraut! could do one of those recipes sometime. Blinies and nalesniki are quite similar to French crepe Suzette. Yum. Either way, I would like some in the plural right now!! I have your cookbook and am wondering if I were to mail it to you if you would sign it. Return paid postage of course. It would make it so much more special when my daughter inherits it! 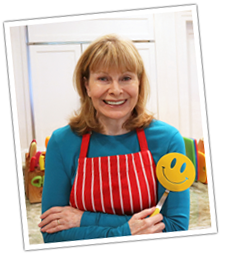 She has MS so we really appreciate your healthy recipes! I have a collection of cookbooks but your recipes are my go-tos! Good recipe Jenny, thanks. To make it even easier replace the egg noodles with a couple packs of Top Raman noodles & 3/4 cup water for each packet. Break up the noodles & stir them into the cabbage, cook until they soak up most of the water, about 2 minutes. I’ve been making this for 45 years. However, I use a 16 oz bag of noodles and substitute the cabbage with a large jar of sauerkraut, drained. I also add 2 links of smoked Polish sausage cut into thin slices. That’s my favorite! I’m just curious, Are you part of Germany? Sorry, I’m not German. I’m Polish. You are a gem! Thanks for making all your recipes so cook friendly! You are a hilarious lady. Thanks for making your recipes so user friendly. The one comment about your recipes is that I would love to see a calorie breakdown. I read that in Polish this dish is called łazanka. Haluski is the Czech name-can anyone else verify this? I have made it four times in the last two months. Everyone loves it with a little bacon crumbled in. Delicious comfort food. Jenny, I am so pleased that you posted this recipe. Definitely a Polish staple and you make things so easy. Love your recipes. I love your recipes and your videos!! I also have your cookbook. Everything is just so delicious and easy to make. Thank you so much!! This recepy brought to me memories from my childhood . I live in Canada for 51 years and never give up on food I enjoyed while living in Europe . Can’t wait for new recepy?! You are so sweet lady! I’ve always loved cabbage and noodles cooked together but didn’t know it was actually a thing. Definitely going to try this easy recipe. It sounds delicious.